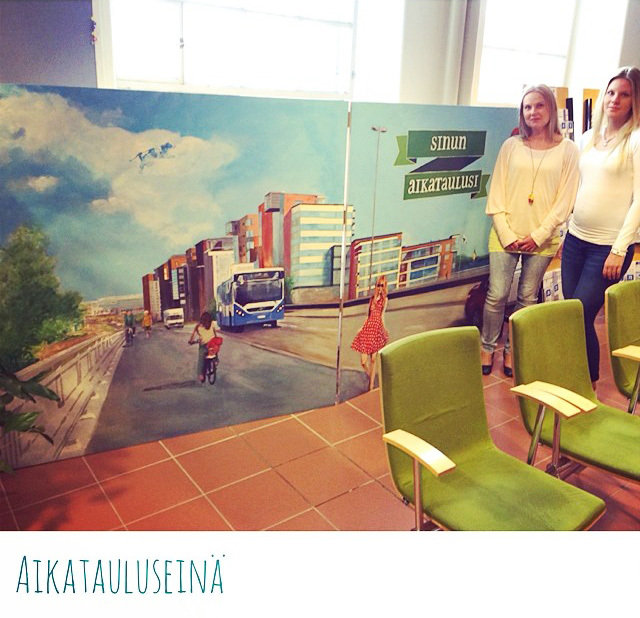 In April 2014 Salotto received a request from EcoFellows Ltd and Tampere City Public Transport to design and implement wall mural with public transport timetable for Valtteri Midsummer Festival. EcoFellows’ Mobility Management is the name given to the incentive-based promotion of sustainable forms of mobility. The goal of the project is more-environmentally friendly transportation that is cheap and functions well. The painting promotes cycling, walking and public transport. It’s peaceful – a little nostalgic – and colorful. The overall impression is blue-green, so that it fits the customer's visual identity. It is a reflection of Tampere Midsummer celebrations, community spirit, and clean urban environment. Wall mural was carried out with acrylic paints and protected with outdoor varnish. Material acquisition began in early May and I got to use Moreenia’s (the Centre for Urban Environment) wonderful workspace. 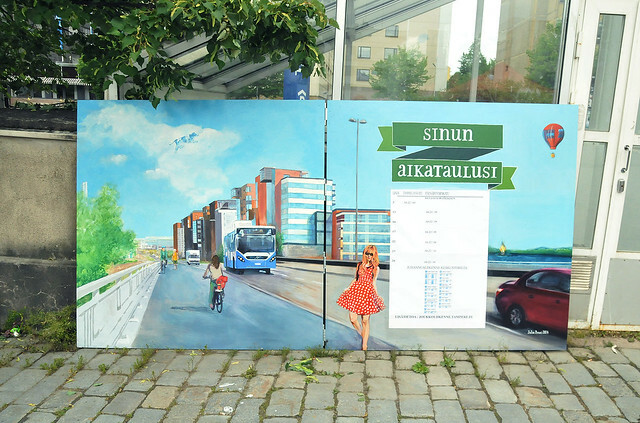 The first use of this mural was for the Valtteri Festival, when the painting presented Midsummer public transport schedule. Thanks to the hinges, the mural can be transported to fairs and events in the future. Both subscribers can utilize the wall painting in their own marketing. 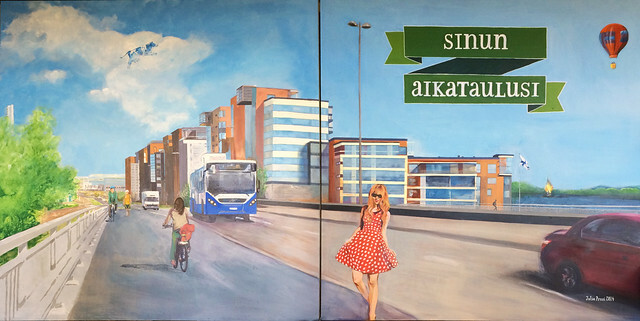 The painting is now on permanent display in the lobby of Tampere City Public Transport Customer service desk at Frenckellinaukio 2 B, Tampere.